The future of deer hunting in California for the next 20 to 30 years is being shaped now as the Department of Fish and Game is holding a series of Stakeholder sessions. They want to get feedback from deer hunters about if and how the drawing for deer tags should be changed and what should happen with the present deer zones. The meetings started in July and will go until at least the end of the year. 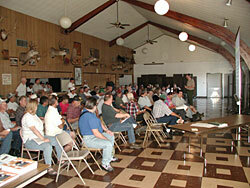 At the February meeting of the Fish and Game Commission the DFG will present its findings. There is still time for you to attend one of these meeting, check out the current DFG Schedule. 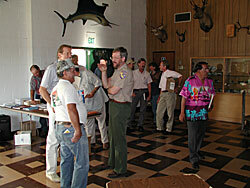 WesternHunter.com attended the meeting in the Modesto area (held at the Oakdale Sportsmen's Club). This was the second meeting  the first was held the night before in Chico and had an attendance of approximately 60 people. The Modesto meeting was attended by a little over 70 individuals. Sonke Mastrup, Deer Program Coordinator for the DFG, gave a very good presentation which included possible options for the deer tag drawing and possible changes in the deer zones. In addition, questions were answered and comments were heard throughout the 3-hour meeting. Check out the Questions. You can tell after reading some of the questions that rumors have affected the way hunters believe DFG manages deer in California. A number of important Facts were discussed at the meeting. To get more, attend one of the upcoming meetings. Sonke Mastrup, DFG, greets some of those entering the Oakdale Sportman's Club. Over 70 people attended the second Stakeholder session of the many which will be held throughout California.